Bumps and Babes is passionate about preparing you for the most positive birth experience and for the early challenges of parenthood, through support, empowerment, information giving and exercise. 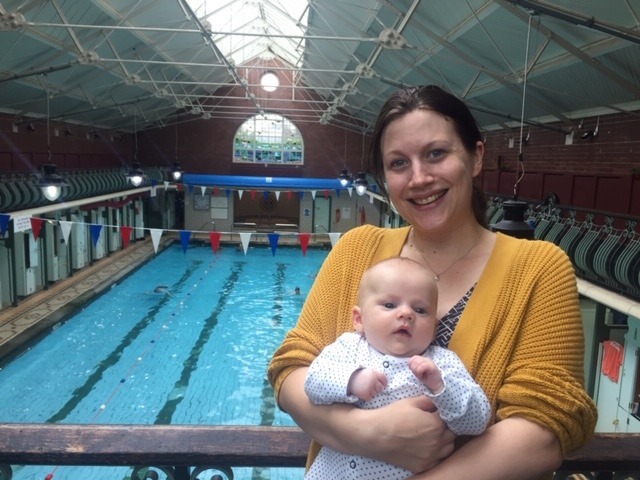 The aquanatal class at Bramley Baths is a fun, safe form of exercise specifically designed for pregnancy from around 12 weeks until baby arrives. The water offers a wonderful therapeutic and supportive environment, and creates welcoming buoyancy and weightlessness which provides the freedom to stretch, breathe and exercise, resulting in an optimum full-body workout for you and your baby. Pre and Post Natal exercise classes are low impact exercises to help women get fit, cope with the increasing demands of pregnancy and motherhood and prepare for birth in a safe, fun and effective way. The sessions pay particular attention to your posture, back and pelvic floor. Michelle Blanchard, 35, attended both the Aquanatal sessions while she was pregnant and the Baby Aquanatal once she’d given birth. “It’s reassuring that there is a midwife team there and you’re not doing it by yourself. You also get to meet other pregnant ladies and chat about pregnancy and what’s happening with that. “Some of the mums continued through to aquanatal babies, where you get to bring your baby along. This was good as I got to keep in touch with people. “It’s really gentle exercise and gets you using your muscles again, which is good for me and also exercise for baby as well. It gets them used to water at an early age. Aquanatal is held every Wednesday at Bramley Baths from 7.15pm, while pre and post natal exercise runs 11am to noon. More details on the Bumps and Babes website. Specialist midwives Sharon and Shelley are also running ‘Passport to Natal Health’ sessions. Are finances, anxiety, weight management or lack of motivation stopping you from keeping physically active in pregnancy or following the birth of your baby? Would you like to benefit from a range of health benefits for you and your baby, including improved sleep, energy, better birth, quicker labour, support and friendship? Get in touch at [email protected], or call Sharon on 07905 143835 or Shelley on 07950 401713. Vouchers are available for Passport to Natal Health.